The Academicum Catholicum association, more familiarly known as the AC, was founded in 1936. The aim of the association is to promote knowledge of the Catholic faith and be a forum for matters of faith and culture. There are corresponding associations in the other Nordic countries. A key form of work for the Academicum Catholicum is to arrange lectures and debates. Each year there is also a traditional spring outing and Masses ar said annually (in memory of St Thomas Aquinas and for the souls of the association's departed). 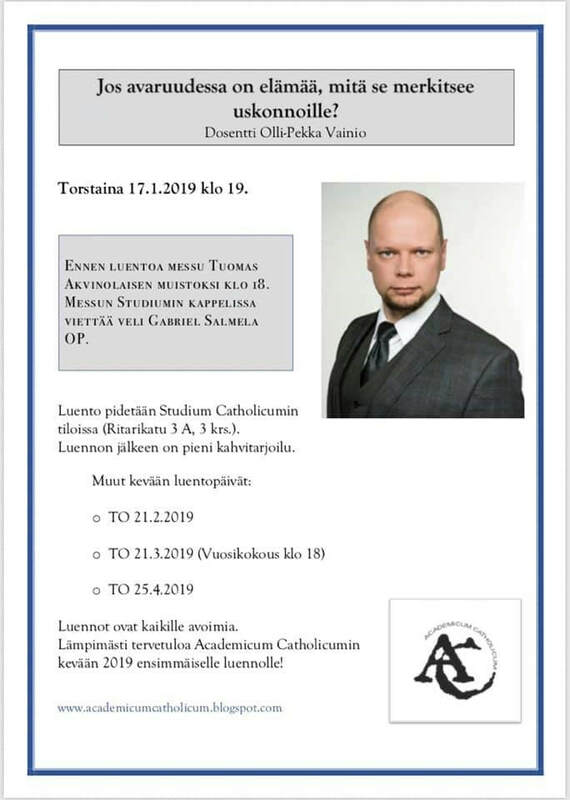 AC meetings are held at the Studium Catholicum in Helsinki. Lectures are open to the public and are traditionally given in either Finnish or Swedish. You can joing Academicum Catholicum by notifying the association of your name and address and by paying the membership fee into the AC account. Academicum Catholicum is on Facebook and has a Youtube channel.